This is a 3-step multi-tasking facial treatment. Step 2: Revital Ampoule provides anti-wrinkle benefits. Restores vitality, strength & radiance to skin. 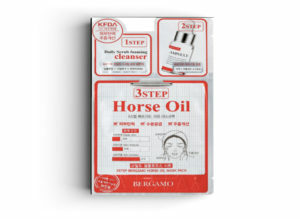 Step 3: Horse Oil Mask Pack is made of a bio-cellulose sheet. Formulated with horse oil that provides intense moisture to dehydrated skin. Blended with adenosine for anti-wrinkle properties. Skin appears softer, smoother & more elastic.